Taylor is studying how differences in the hormonal stress response of urban and forest brown anoles (Anolis sagrei) may have enabled these populations to respond differently to Hurricane Irma which struck Central Florida as a category 2 on Sept 10, 2017. Blood and brain samples collected just prior to and following the storm will be used to measure corticosterone concentrations and energy metabolites, and also alternative physiological metrics such as the blood cell counts and hematocrit. In addition, comparisons of population densities and behavioral interactions will permit one of the most comprehensive studies of the impacts of a natural disaster on a wildlife species as well as address basic questions about the role of the vertebrate stress response in facing unpredictable challenges. Taylor will also be leading the lab's latest effort to study the impacts of urbanization on the absolutely wonderful common snapping turtle (Chelydra serpentina). ​Ada is investigating the differential gene expression of steroid synthesizing enzymes in brown anoles (Anolis sagrei) that have either been fasted or fed. Specifically, Ada will be testing the hypothesis that fasting increases localized steroid production in a wide range of tissues, and this will likely include increasing the concentrations of the necessary enzymes. Local steroid synthesis is a relatively recently described phenomena, that would suggest tissues can generate their own steroid needs apart from the classic endocrine pathways we learn about in school, however the factors precipitating this unclear, but perhaps metabolic shifts might be involved. Understanding the conditions that promote local steroid synthesis has implications for hormone-dependent health conditions, such as steroid-dependent cancers. Ada is a master of reverse-transcription and she is currently optimizing PCR conditions and testing primer sets for eventual use in quantitative PCR (qPCR). This special molecular skill set she acquired in her biology courses here at Rollins. You can read more about Ada's research on her poster. Leah is investigating how energetic state influences the propensity for aggression during territorial bouts in the male brown anole (Anolis sagrei). Leah has been working on testing various conditions of food security including 1) fasts of different durations; 2) varying the degree of predictability in the food supply, and 3) varying the caloric content of their cricket diet. She is spending the summer watching videos of lizards fighting over food and making their characteristic territorial displays. By developing a solid, repeatable behavioral paradigm for testing aggression under food insecurity, her work can then be used on other species, and hopefully will mark an new area of interest in behavioral ecology. In her downtime, Leah is also actively involved in our lab's Econ River Urban Herp project, where she gets to drive the Kawasaki Mule. Leah presented this research at the Society for Integrative and Comparative Biology (SICB) meeting in San Francisco in Jan 2018 as a poster. Mica is exploring the relationship between a protein, known as neuropeptide Y (NPY) and food intake in the brown anole lizard (Anolis sagrei). This neuropeptide is implicated as the central appetite stimulating molecule within the brain, but NPY might also be involved in other behaviors, such as aggression, thus providing a possible biochemical link between food availability and territorial behavior. Mica is spending the summer determining the proper dosage and routes of administration that will alter food intake in this species, and will spend a lot of time watching videos of lizards eating. Somebody's got to. In the future, we hope to expand this study and determine the receptor that NPY might be using and the brain areas involved. Mica is also an avid naturalist and is actively involved in our lab's Econ River Urban Herp project. Mica presented her research at the Society for Integrative and Comparative Biology (SICB) meeting in San Francisco in Jan 2018 as a poster. Rachael is investigating how acute fasting influences the ability for steroid synthesis by both the classic steroidogenic organs (e.g., testes, adrenals) but also other tissue types. Using the brown anole (Anolis sagrei) as her model, she plans to measure steroid concentrations across a range of organ tissues. This research could expand our understanding of the how energy status can impact localized steroid production. Rachael was also absolutely instrumental in setting up the lizard colony at Rollins College and troubleshooting the initial husbandry of the animals. Findings from Rachael's work is available on her summer research poster. Sarah investigated how energetic state influences the link between hormones and territorial behavior during the non-breeding season. 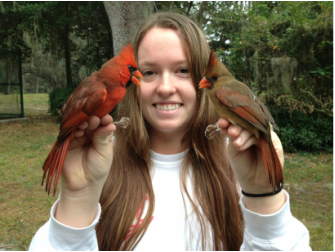 She conducted a food supplementation experiment on wild Northern cardinals (Cardinalis cardinalis) during the winter months and measured territorial behavior and changes in circulating levels of the adrenal steroid hormones: corticosterone and DHEA. Although much is understood concerning the role of steroids in regulating aggression during breeding, much less research has examined the relationship between hormones and behavior in the non-breeding seasons of animals and especially the role of food availability. This study was the first to examine how food impacts non-breeding territorial behavior in a wild animal. Read more about Sarah's research on her poster. As an aspiring veterinarian, Zoe developed a novel method for the extraction and purification of the stress hormone, cortisol, from the nail of the domestic dog (Canis familiaris). Through a collaboration with Loch Haven Veterinary Hospital, and using a homogenization and solid phase extraction technique perfected in the lab, Zoe could quantify cortisol from the nail. This is a significant achievement, as this embedded cortisol signature provides an index of cortisol secretion over a long period of time, unlike current methods used in the veterinary industry (e.g., blood, saliva, and hair) which either provide measures of current cortisol levels (that likely increase in a dog just by seeing the Vet's office) or require large amounts of sample to detect cortisol. This novel technique can potentially be used to diagnose many canine ailments that alter cortisol production, including Cushing's and Addison's diseases and adrenal tumors. Zoe presented this research at the Society for Integrative and Comparative Biology (SICB) meeting in Jan 2014 as a poster. Ben was involved in a collaborative project (with Dr. Kiran Soma at the University of British Columbia) investigating seasonal changes in appetite-stimulating neurohormones: neuropeptide Y and orexin in the brain of song sparrows (Melospiza melodia). In particular, he was interested in determining whether the behavioral regions of the brain contain these neurohormones, and whether the degree of immunostaining varies between birds sampled from the spring breeding season and the winter non-breeding season. Both of these neurohormones increased in the non-breeding season, but in specific regions of the brain, including many of those that express the enzyme aromatase that regulates estrogen levels in the brain and stimulates aggressive behavior. The data Ben collected provide further evidence for a role of energy in regulating the mechanisms that control non-breeding territorial behavior in birds. Ben presented this research at the Society for Integrative and Comparative Biology (SICB) meeting in Jan 2014 as a poster.